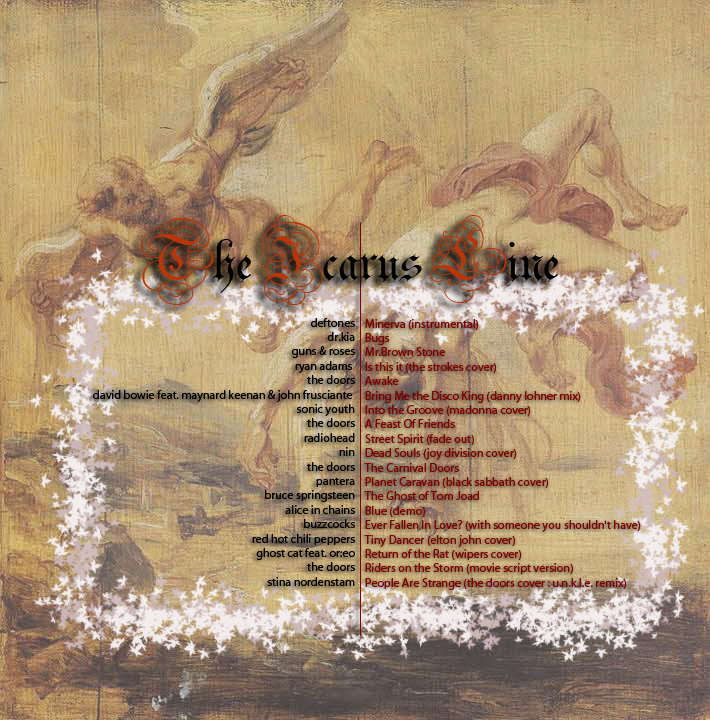 The Icarus Line is a compilation I made for this loser I knew. What makes this different then the others I have been putting up is the fact tat it was done in 2003. He found it in his collection after I had been bugging him for almost a year to find it. A lot of the bands I still love but more then that there are some crazy covers that i found with that program Kazaa. I was going through a weird ‘Doors’ faze that is very evident on this compilation. Enjoy this blastr from the past I did. P.s. – Excluded one track that actually is track listed. There are some tracks no one needs to hear again. This entry was posted in #FMD and tagged alice in chains, back sabbath, bruce springsteen, buzzcocks, danny lohner, david bowie, deftones, elton john, free, ghost cat, guns n' roses, john frusciante, joy division, llapingacho, madonna, maynard james keenan, music, nin, nine inch nails, oreo, pantera, radiohead, red hot chili peppers, ryan adams, Sonic Youth, stina nordenstam, the doors, the strokes, tool, unkle, wipers. Bookmark the permalink. Hola Guayaquil Rock. Si estamos subiendo todo a un servidor.